Social Interpretation moves onward. We are just snagging our app and sorting digital assets for more QR code roll out in the next month or so. 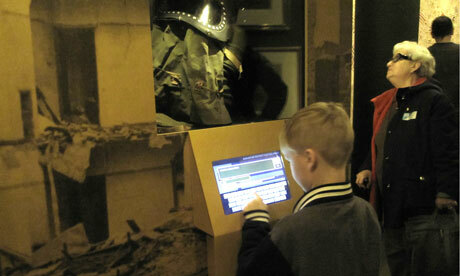 In July we will install 4 SI kiosks and 10 QR codes against objects in Imperial War Museum North. We have scaled up the kiosk size and are using touch screens rather than tablets. Tablets have not been so successful for us, maintenance-wise and usability-wise. We are also going to change the user interface for the kiosks in the North, to ‘visitor voice’. This is so that they become proper comment kiosks, rather than, as they are in London, digital labels and comment kiosks – we think this will clear any confusion as to the purpose of these things. So, how engaged have people been with the idea of commenting against our museums objects? We have had quite a few interactions – over 2,700 comments since April 5. They include lots of spam and lots of comments saying the museum is great. But there have also been some rather affecting comments. Strange to think that this was not so long ago! I can remember the war as a teenager, only seems like yesterday. Tomorrow, I celebrate my 82nd birthday! We hope and expect the level and depth of engagement to increase when the SI web pages go live. If you are sat in the comfort of your own home, browsing objects you are interested in, you are much more likely to think, type, collect and share it. Probably more likely than you are to in a busy gallery, typing on to a small tablet screen. And the QR Codes? Well, they are another story.. Still, it’s worth holding on for a little while more perhaps, once the visitors get used to the kiosks? I can imagine a lot of spam though and if the goal is to get useful information, I guess it could get lost in the sea of useless comments.